Researchers found answers in Galileo's data. Evidence gathered decades ago by the Galileo spacecraft substantiates reports of water-vapor plumes coming from one of Jupiter's moons, Europa. 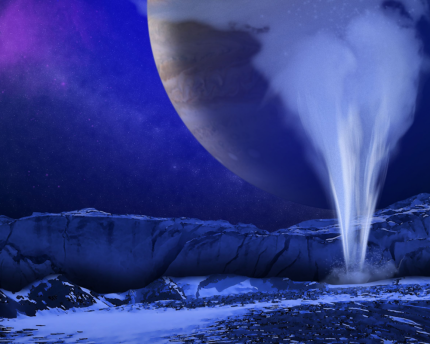 Scientists reanalyzed decades-old data from Galileo’s closest encounter with Europa and found that it offers evidence that the moon’s subsurface liquid water reservoir may be venting plumes of water vapor, according to NASA. The Galileo was launched in 1989 when President George H.W. Bush, now 93, was in office, but scientists are still using its data. The spacecraft made eight targeted passes by Europa during eight years in orbit around Jupiter, notes the research, published Monday in Nature-Astronomy. Twice, the spacecraft zoomed close to the surface -- coming within 400 kilometers, or 248 miles -- a distance that would have enabled the plumes to register on its instruments. Specifically, the Galileo carried an instrument known as the Plasma Wave Spectrometer to measure plasma waves caused by charged particles in gases around Europa’s atmosphere. While scientists have long held that data, they now can use sophisticated computer modeling to help understand what the spacecraft encountered. And through studying another moon, Saturn’s Enceladus, they had learned that material in plumes “becomes ionized and leaves a characteristic blip in the magnetic field,” the space agency explains. When scientists re-examined the Galileo data, they looked for and found that blip in one of the Europa flybys. The researchers put the magnetometry and plasma wave signatures into computer 3D modeling developed at the University of Michigan. Data from the Hubble Space Telescope was used to estimate dimensions of potential plumes. The simulated plume that resulted matched the magnetic field and plasma signatures taken from the Galileo. The article is, "Evidence of a plume on Europa from Galileo magnetic and plasma wave signatures" by Xianzhe Jia et al. It has been published in the journal Nature Astronomy. Jia is an associate professor with the Department of Climate and Space Sciences and Engineering, University of Michigan, Ann Arbor. If you wish to comment, like us on Facebook and tell us what you think.